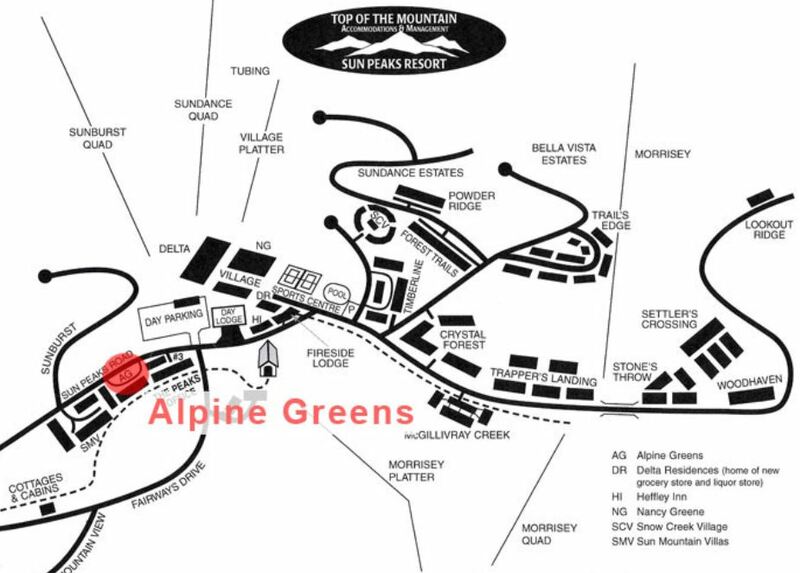 The Alpine Greens Sun Peaks condos are rustic for a reason – they are one of the original Sun Peaks condo developments that was constructed back in the 90’s when Tod Mountain began to morph into now popular Sun Peaks Resort. And if you like the sight, smell and sound of a real wood-burning fireplace, snuggled up with your family dog after a day enjoying the slopes, Alpine Greens are the best (and only) rental condos at Sun Peaks for you! Click for the Best Sun Peaks pricing and discount. These spacious, 1, 2 or 3 bedroom condos are located on Sun Peaks Road, on the right hand side before you reach the main village, and are situated on the 2nd hole of the popular Sun Peaks Golf Course. Walking time to the village is around 5-10 minutes, and parking is outside in designated parking stalls. Driving to the resort would just take you a minute or two where you could park for free and ski the day away. It is around a 500 meter walk to the ski-lifts, and you can ski-in to your Sun Peaks rental condo at the end of the day. 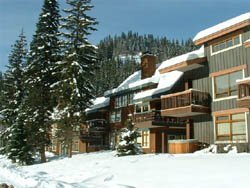 The Best Sun Peaks condo 10% discount (subject to seasonal blackouts) applies to unit #26, a spacious, 950 square foot condo that has a great view of Mt. Morrisey, backs onto the Valley Trail which is great for walking & biking, and sleeps up to 7 people. Click to book directly and save the service fee being charged by most online booking companies and view the Alpine Greens Sun Peaks rental condo photos and the discounted rates and availability, along with access to other Sun Peaks rental condos, townhouses and chalets to which the 10% discount also applies.